Want to send us some cold hard cash? Who are we to stop you?! As a 501(c)(3) non-profit organization, all donations to Tut'Zanni Theatre Company are tax-deductible. We rely on your generous donations to help cover the costs of travel, rehearsal and performing that aren't fully covered by ticket sales and workshop income. We're going to make this real easy for you - just click the donate button! We truly couldn't do what we do without you. Support Tut'Zanni with every purchase with NO additional cost to you by choosing Tut'Zanni Theatre Company as your Amazon Smile non-profit organization of choice below! Check out our Cafepress shop, full of dozens of products featuring the masks Tut'Zanni uses in performance as painted in watercolor by Liam! All profits go to support the work we do creating new theatre. 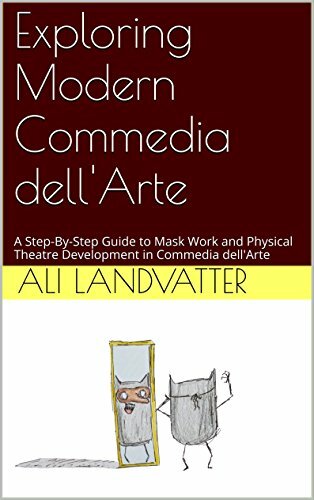 Designed for artists of all levels and experience, ALi Landvatter's book EXPLORING MODERN COMMEDIA DELL'ARTE provides a quick and informative guide for everything from form and technique to character and show development in a modern exploration of the ancient Italian masked theatre, Commedia dell’Arte.